Buses and groups are welcome at the Shipshewana Flea Market. Jaws will drop at the treasures and bargains in all 26 of the flea market's gigantic aisles. Flea Market Hours: Tuesdays & Wednesdays, May through September, 8 a.m. - 5 p.m. EST. Also open Memorial Day, 4th of July & Labor Day. Lodging specials across the street at the Farmstead Inn & Conference Center! Contact Lora at 260-768-4129 or lora@shipshewanatradingplace.com for assistance on planning your group's trip to the flea market. We'd be happy to recommend itineraries or help you accommodate your group's specific needs! The Shipshewana Flea Market is located at 345 S Van Buren St, Shipshewana, IN 46565. 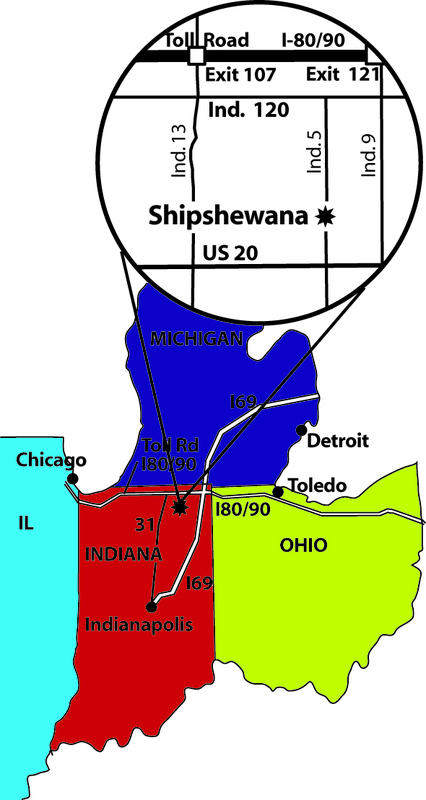 Shipshewana is less than 200 miles from Chicago, Detroit, Indianapolis, Grand Rapids and Toledo. The Indiana Toll Road (I-80/90) passes through the northern fringes of the county (Lagrange) and serves Howe and LaGrange with exits 107 and 121. US 20 connects Shipshewana and LaGrange to Elkhart and Angola. Indiana State Highways 3, 5, 9 and 120 also pass through the county.